In a former warehouse just steps from the remains of the old Asheville Cotton Mill in the River Arts District, where workers once manufactured denim for Levi Strauss, employees of The Old Wood Co. are making wooden tables for Starbucks. The product is different, the scale is different, and the times are different, but there is a common thread: Well-paid, skilled workers are making quality products here in Western North Carolina. What's more, the business is thriving, even in a cheap, made-in-China world. For founder Darren Green, who started the company in 2007, establishing good jobs for locals is just as important as creating unique and beautiful products, and this intentional approach to business is one of the company’s biggest strengths. 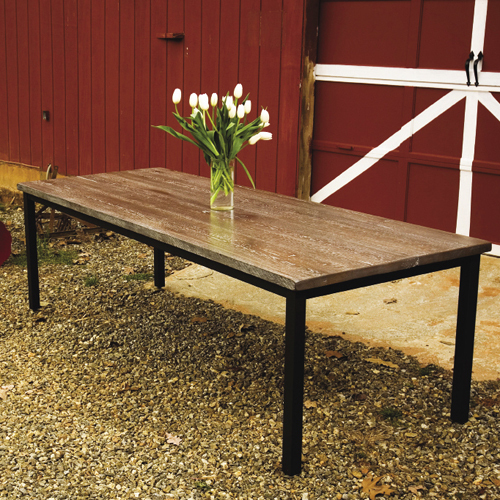 The Old Wood Co. makes “modern rustic” tables and desks, many from reclaimed barn wood and others using new wood sustainably sourced from Southern Appalachia. The designs and finishes are contemporary and distinctive, some with metal bases by local artists, including Matt Waldrop and Hoss Haley. “Custom is our standard” is the company’s tagline: Because the shop is small, Green can customize the size or finish on any order. While the company has grown to eight full-time employees in the past year, and can accommodate increasingly larger orders, it will never be the vendor of choice for those looking for the cheapest furniture available, says Green. Rather, The Old Wood Co. tends to draw clients who value products that are sustainably and thoughtfully made. Increasingly, people are into it. In addition to creating hundreds of tables for Starbucks’ East Coast stores, the Old Wood Co. has made custom display tables for Todd & Duncan, a chic SoHo boutique, and the Chicago Museum of Science and Industry. And the company continues to customize its designs for individuals and designers as well. Although he grew up in St. Petersburg, Florida, Green has deep roots not just in Asheville, but in the North Carolina furniture business. His great-grandparents, Hattie and Barney Pearlman, started Pearlman’s Furniture in downtown Asheville in the 1920s. Wood spent 10 years working as a manufacturer’s rep for upholstered furniture maker Lee Industries in Newton, where, he says, he came to recognize the power of customization and how it can give small companies like his an edge over large-scale manufacturers.